Here you will find advice on cocktail party drinks - what you should offer and how to serve them. Also, how much you need of what. Cocktail party drinks? … Cocktails, right? Yes, cocktails, but not only cocktails. Not everybody likes cocktails and many people (like drivers, children or those with religious or health restraints) prefer non-alcoholic drinks. 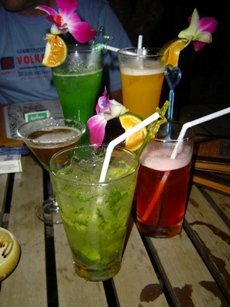 It is important to have a good variety of alcoholic and non-alcoholic mixed and other drinks available for your guests. For the cocktails, you need a good stock of a variety of spirits, liqueurs and mixers available – see our Guide to Stocking your Home Bar for more on this. If you are going to be the bartender yourself, or you are going to let your guests try their hands at cocktail mixing, it is advisable to decide on 8 to 10 simple to make cocktails before the party and get all the necessary ingredients for these. Try to select cocktails with overlapping ingredients if you are budget conscience. TIP: Consider to hire a bartender if you are having more than 10 guests and the venue of the party does not have bartenders, like your home for example. Allow about 1 to 2 drinks per guest per hour, considering that an average drink is about 250 ml to 350 ml (9 Oz. to 12 Oz.). It is of course not uncommon for guests to bring their own drinks of choice and feel free to state on the invitation that they can/should bring their own drinks if this is appropriate. If you are providing the fluids, think before you go shopping what the drinking habits of our guests are if you know them. Or simple ask them. Another idea is to make the party “bring a bottle” or bring your own ingredients, in other words every guest or pair of guests bring a bottle of spirits and/or the other ingredients representing the base ingredient of “their” cocktail. Alternatively you can ask each guest on his or her invitation to bring a particular ingredient for the cocktails you plan to serve. This helps to avoid 25 bottles of tequila and nothing else arriving, by way of example. If you want to let your guests mix cocktails themselves, it is advisable to have a number of shakers and measures available so that guests can mix cocktails simultaneously. Have available a stock of mainstream beer or lager of medium strength. If you want to be a bit more impressive, get hold of some fruit-flavoured beer. Stouts, like Guinness, are also quite popular in some parts of the world. Not everybody drinks beer, so you should be safe if you have 1 for every two guests. Beer is generally served in a beer glass or mug, so have a few of these available. An ever popular drink just about everywhere in the world. An average bottle will give about 5 glasses. If you have each of an off dry white (like a Sauvignon Blanc), semi sweet white and a blended easy drinking red variety available, you should be fine. Wine is of course served in wine glasses. White wine glasses are traditionally a bit smaller than red wine glasses (to allow for the higher level of aroma to fill the glass), but don’t worry if your wine glasses are all the same size. Punches are particularly great cocktail party drinks for bigger parties in summer time. See our Punch Recipes Guide for great recipes. There is a massive variety of mixed and other alcoholic drinks available, with more seeing the light regularly. For example, here we talk about a cooler like Bacardi Breezer – a fruit flavoured rum based fizz drink. These types of drinks are nice alternatives to beer and wine. Look around in the liquor store – you never know what you might find. You should already have a variety of mixers like fizz drinks, sodas and juices available. Be sure to have cola (including a low carb/diet variety), lemonade and mineral water (sparkling and still) available. These drinks can be served in just about any glass. Consider serving non alcoholic cocktails as well. Very importantly, have a sufficient supply of ice, particularly if it is summer and hot. You can skip this section if you have a home bar for the party or the party venue does have a bar. You will need to set up a temporary home bar from where you will serve the cocktail party drinks. Make sure the location of the bar is easily accessible and it’s out of the way. A quiet corner, a spare room or even the garage will do. Bear in mind that a bar tends to attract a lot of visitors, so make sure there is sufficient space around and behind it for numbers of people to pour drinks and just stand around to have a conversation. The actual bar can be any table – even a fold up version – with a nice tablecloth. Even the kitchen bar top will do. Do not over-decorate the bar counter, as you need the space for drinks and bottles. Ensure the decorations on and around the bar is consistent with your theme (if you have one) and other decorations for the party. Alternatively, and if you plan to make use of a bar more frequently but do not want it as a fixture in your house, consider a portable version with bar chairs. These portable home bars are available from furniture and some bar stores and there are some really good looking and functional varieties available. The price obviously depends on the size, style and quality. Expect to pay anything from $500 for an entry-level bar to $10 000 and up for fancy versions with built-in refrigerators. A cool addition or alternative is to have a bar trolley which can be moved around between your guests. They don’t have to go to the bar, the bar comes to them! Your bar will ideally need a refrigerator to keep drinks cold and ice frozen. Alternatively, or if you need additional cold storage, get a number of cooler boxes filled partly with ice. This should see you through the party easily. You should also have a stock of napkins, straws and swizzle sticks. See our Guide to Stocking Your Home Bar for more tips. TIP: For more great ideas for your cocktail party, see our guides on cocktail party food, cocktail party themes, cocktail party invitations, cocktail party drinks and cocktail party music.